Messrs. Buchanan, Stokes and Walker were back after promoting their fantastic “Death Shall Rise”. This time augmented by lead guitarist Barry Savage. But the times they were a-changing, as we shall find out. 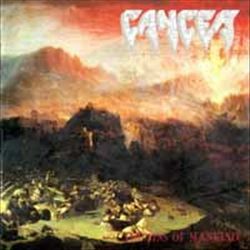 Since 1991 CANCER had done something to John Walker´s throat, or rather the steadfast trends of death metal I believe, and there were more features like grind and the hardening musical climate. Like with opener “Cloak of Darkness”, which feels superior as a demo, but the final version is more brutal and adapted to American trends. Comparing demos to final products is always interesting, not least in this case, as the vocals had not been added/written. The basic song idea is most interesting though with a cosy guitar riff and pattern, yet it feels lost in the form that reached the record buyers. Sadly it is the likes of the somewhat blackish “Electro-Convulsive Therapy” and the WC in speedy and repellent death thrash of the genre decline years that drag this album down. The bottom line of a creative band with new ideas is still there, as in “Cloak of Darkness”, “Meat Train” and “Suffer for Our Sins”, but is has been “blessed” with the sound of the day in 1993, as well as the first steps of blackish death-thrash, which do them no favour in my ears. The drumming s also steering of in another direction as the studio and demo versions of “Electro-Convulsive Therapy” reveals. The magic arrangements are also here, but more lurking in the shadows than up front, as on their two first releases. If you need to slightly cut back on spending on releases, the first two will be necessities while the “difficult third album” is exactly what the term says.